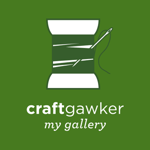 ← Bake: Pugliese – artisan bread time! Good news and bad news today (not very bad though, don’t worry 🙂 ). Good news is Phil fixed our laptop! He’s handy that boy (he has also been known to fix our washing machine, other people’s washing machines and even the odd dodgy bit of car in the past). Bad news, Phil and I are back into revision again (I know, it doesn’t feel like long since the last bout, yuck!!!). So, I’m take a study break to stop by this evening and share with you a super fun project I’ve worked on during evenings over the past few weeks. So, without further ado, let me introduce Mr. Moose. 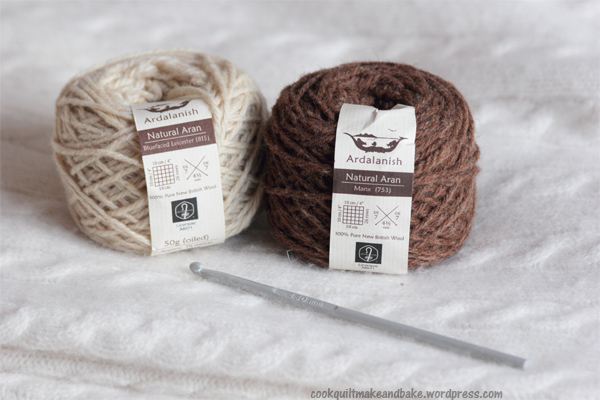 It is made by Ardalanish on the Isle of Mull (which funnily enough is where I worked on one of my last knitting projects, you can read about here) and comes in three beautiful breed’s natural (i.e. undyed) shades: Bluefaced Leicester, Manx Brown and Hebridean Brown. 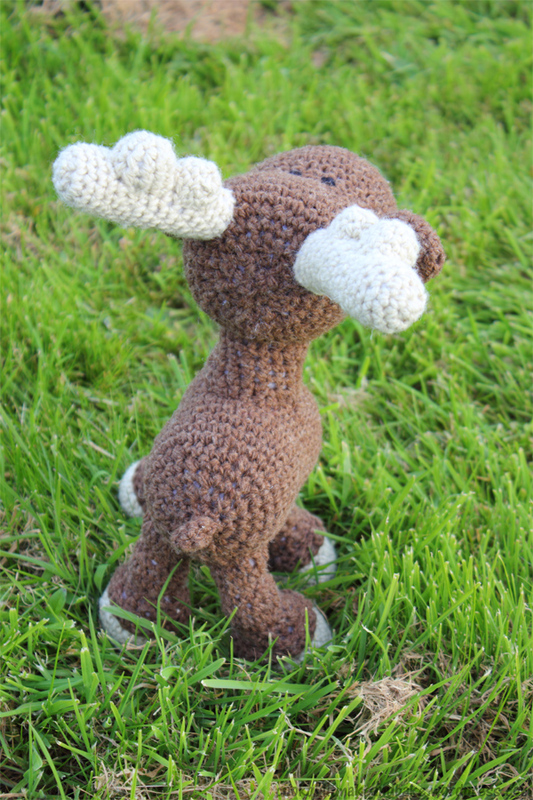 I got two balls of Bluefaced Leicester and two balls of the Manx Brown, and more or less from the minute I opened them, I knew they were perfect for the project I’d been storing up on Ravelry for a while, a cute as anything amigurumi moose. Now, I should preface this post by saying that I am not a pro crocheter. I would always call myself a knitter first and foremost (actually, thats not true, I’d call myself a quilter, but in terms of working with yarn I knit far more often than I crochet.) In fact, my crochet experience only really stretched to the odd granny square for a blanket. So I knew the moose was going to be a challenge. Also, the pattern does say that it’s is not suitable for beginner’s. But never one to shy away from a challenge (or perhaps just a glutten for punishment!) I gave it a go anyway, and slowly slowly made progress. When I encountered a stitch I didn’t know I searched for it on youtube, watched a few tutorials and practiced it until I’d got it down and then used it in the pattern. 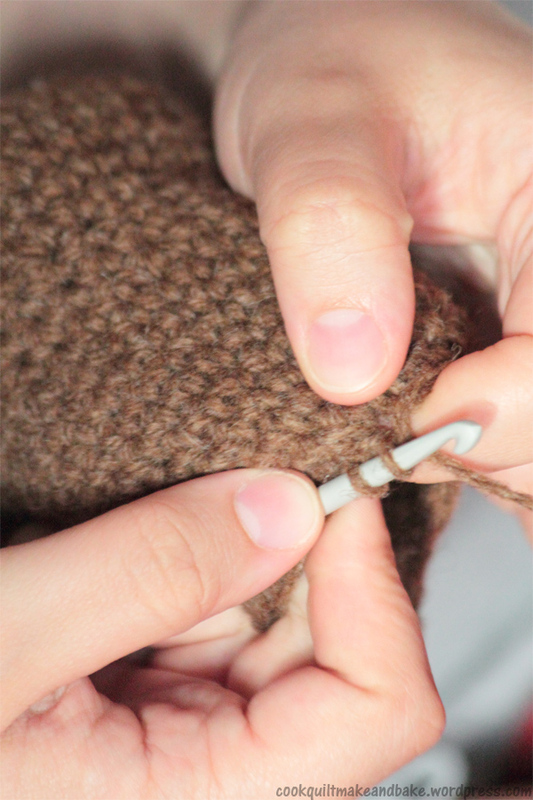 The nice thing about crochet too, is that if you get your stitch wrong (as happened many many times!) 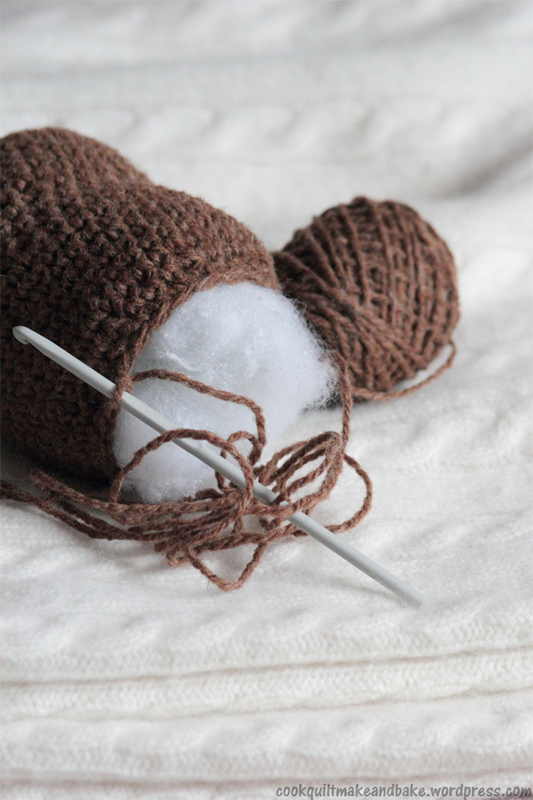 you can just pull a stitch back and try again (which is always trickier in knitting). So, now that the project is finished what so I think about the ‘not suitable for beginners warning?’ Well, I would say I half agree (nothing like sitting on the fence lol). 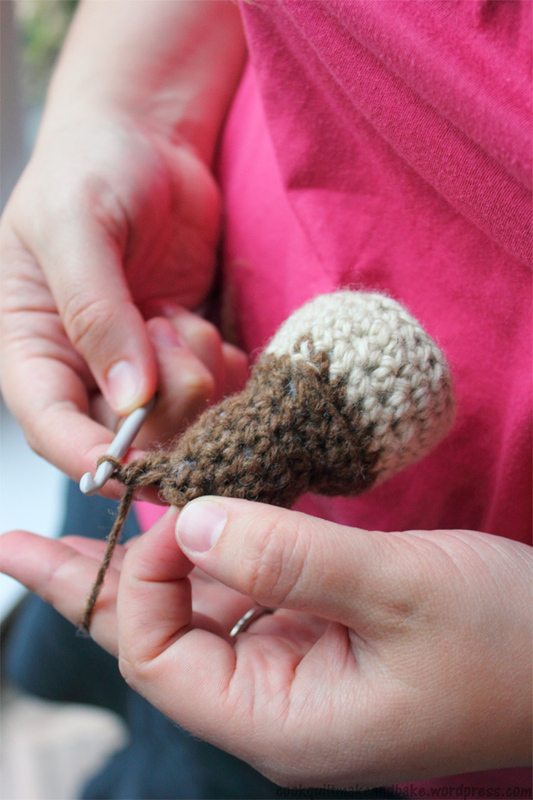 If today is your first day picking up a crochet hook then probably the moose is a bit of a big first step, so not for total beginners. But, if you are just new to amigurumi but have a little bit of time to persevere and like learning as you go I think its actually a great pattern to start on. Luckily, Mr. Moose was finished just in time for taking on a very important job. My little brother, who is now sadly not so little at all, moved out last weekend to start his first proper grown up job and live in his first proper grown up flat all by himself. So, I tasked Mr. Moose with the respectable job of being a guard moose for my brothers new flat. After all, living alone for the first time can be a bit freaky for the first few weeks, so who wouldn’t want the company of a friendly moose to keep them safe on their endeavours in the big wide world? 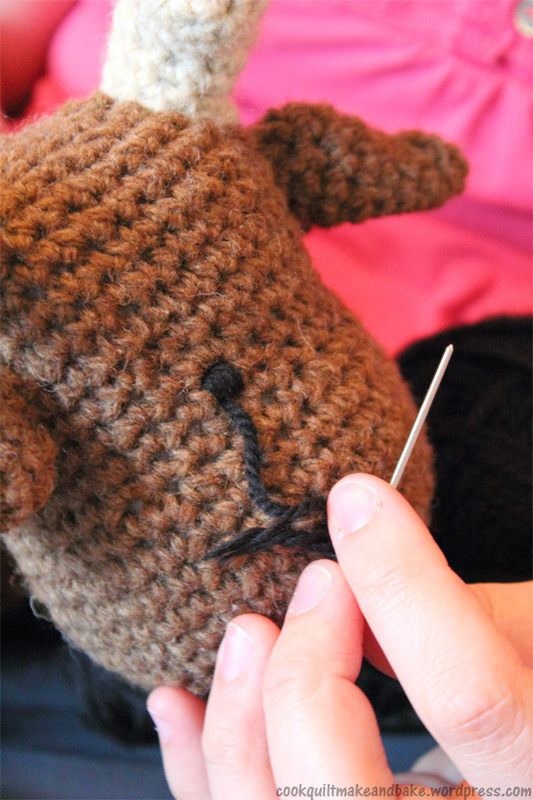 So, before I embarrass him anymore (he he he), lets get down to the nitty gritty of making a moose. The first order of service was to crochet all of the constituent parts. This included a round oval body, a slightly bigger round oval head, a neck, 4 legs, a tail, 2 ears, and 2 antlers (which were made of one long sausage shaped tube and 2 little nubbies). 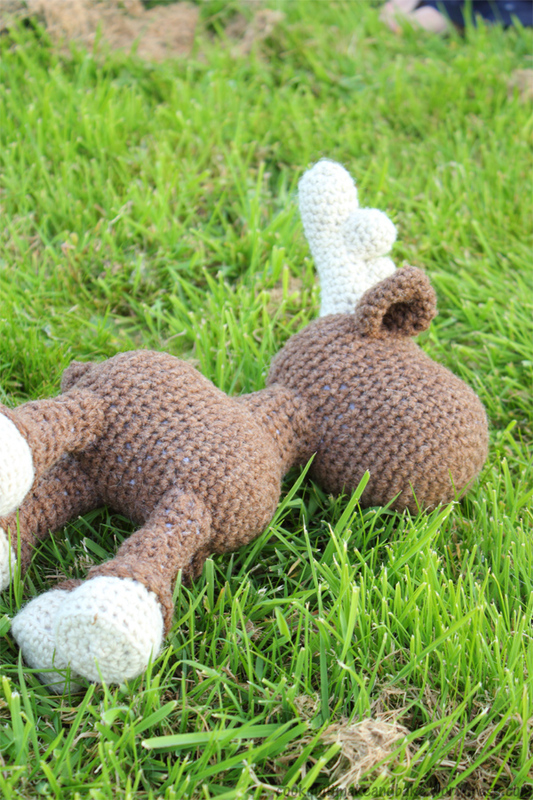 Everything was crocheted in the brown, apart from the hoof end of the legs and the antlers which were crochet in cream. I checked out a few mooses on the internet and I think a brown body and cream antlers is more ‘moosey’ and less ‘deery’. Before finishing each shape, I stuffed it with a polyester filling (I don’t really like adding polyester to things, but the polyester filling is fire retardant which is actually kinda important for stuffed animals) then crocheted it closed ….. the pattern was very good about telling you when to stuff each body part, so you didn’t accidentally leave yourself with too little room. 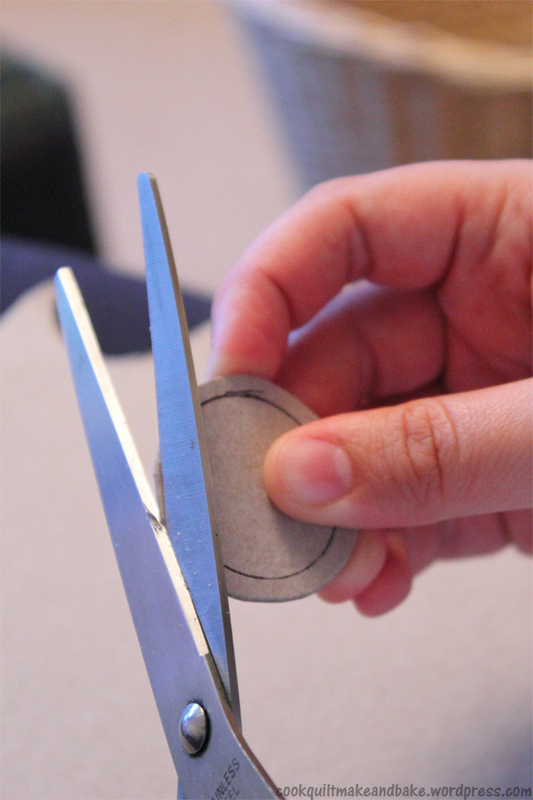 Then all that was left to do was to sew each of the stuffed components together. 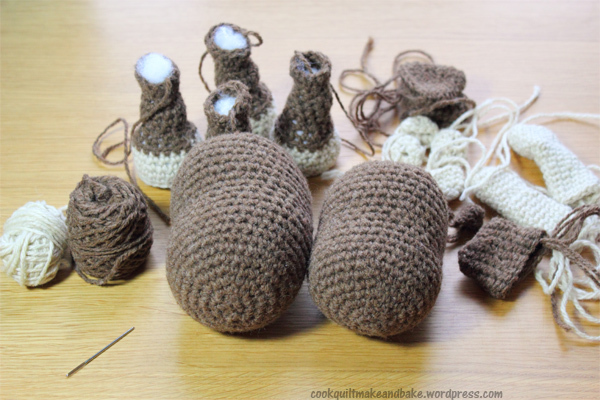 I found an excellent video online, which you can find here, on how to sew together amigurumi crochet pieces invisibly. I can’t recommend it highly enough! It was great and as I was sewing my pieces together I was super thankful I had watched it first! All that was left to do in the end was to sew on his eyes! Here he is finished from behind …..
And right after he fell over mid photoshoot, oopsy lol. The good news is that Mr. Moose arrived with Adam this morning, so I’m pretty sure they’ll be making friends as we speak. 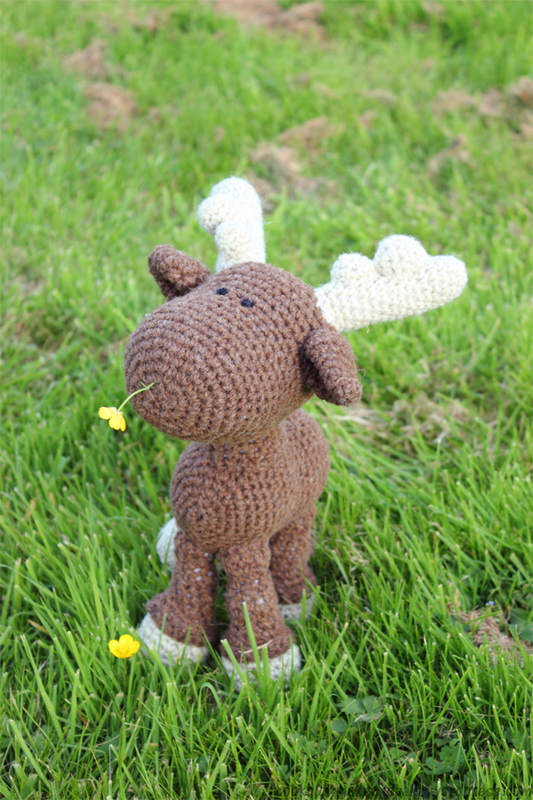 This entry was posted in Make and tagged amigurumi, animals, craft, crochet, cuddly, moose, stuffed, wool, yarn. Bookmark the permalink. Adorable! Did I ever tell you that moose are my favorite animals……? HE IS SUPER SUPER CUTE!!!!!!!!!!!!!!!!!!!!!!!!! He is so cute! I love him! You are truly turning into a very fine crafter. Mr. Moose looks perfect and I love the picture with all the parts. Good job!! Would you ever just make this to sell? I don’t know how to sew and would love this for my baby’s room. Thanks!